Chanteur et contrebassiste Rockabilly US d'origine Italienne, né le 20 Avril 1934 à Yonkers (New York). 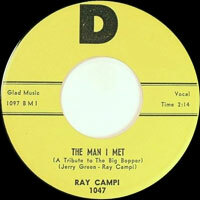 Ray Campi a débuté en 1951, mais c'est en 1957 qu'il enregistre son premier disque publié sur TNT Records. 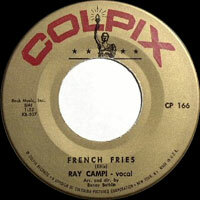 Ray a enregistré aussi pour Dot, Domino, D, Colpix, Winsor, et Sonobeat Records. En 1968, il devient professeur d'Anglais en Californie et est redécouvert en 1972 par Ronnie Weiser qui le signe chez Rollin' Rock Records. Ray Campi, pionnier du Rockabilly, boxeur, professeur d'Anglais, multi-instrumentiste de talent et accompagnateur dévoué est devenu un personnage célèbre. 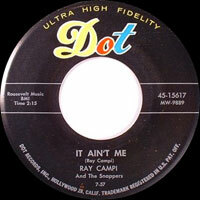 Rockabilly wildman Ray Campi recorded several classic singles during the music's prime era, and later staged a comeback that earned him a substantial cult audience over the '70s and '80s. 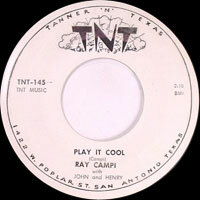 Campi was born in New York in 1934 and moved with his family to Austin, TX, at age ten. He started listening to country music, learned the guitar, and formed his first band in high school, which played on local radio stations. 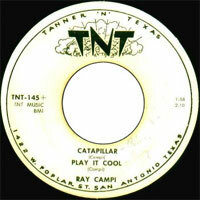 Campi made his first recordings in 1951, but it wasn't until 1956, when he cut the single "Caterpillar" b/w "Play It Cool" for the small TNT label, that any of them were released. 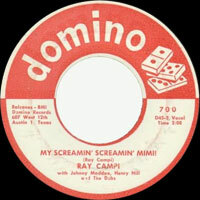 He went on to record for Domino ("Screamin' Mimi") and Dot ("The Ballad of Donna & Peggy Sue"), and moved to Los Angeles in 1959, where he signed with Colpix and recorded "Hear What I Wanna Hear." During the early '60s, Campi lived in New York and spent two and a half years as a staff writer at Aaron Schroeder's publishing firm, but was never allowed to record any of the songs he'd written. He returned to Austin in 1967 and recorded "Civil Disobedience" for the Sonobeat label, but nothing came of it, and he settled in Los Angeles and became a junior-high school teacher. 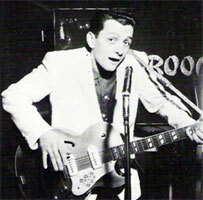 Around 1973, Campi hooked up with Ronny Weiser's revivalist Rollin' Rock label and started making new recordings in the classic, high-energy rockabilly style. A steady stream of albums followed into the '80s, which also brought a couple of sets for Rounder, 1980's Rockin' at the Ritz and 1986's Gone, Gone, Gone!. 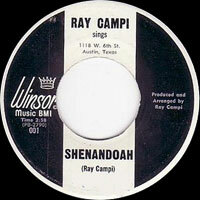 Campi continued to record into the new millennium, releasing occasional albums on his own label. 03/1957 SP TNT TNT-145 (US) . 1977 SP ROLLIN' ROCK 038 (US) . 197? SP ROLLIN' ROCK 044 (US) . 197? SP ROLLIN' ROCK 046 (US) . 1981 ? SP ROLLIN' ROCK 047 (US) . 1981 ? SP ROLLIN' ROCK 052 (US) . 1975 LP 12" ROLLIN' ROCK LP 004 (US) ROCKABILLY LIVES - Hot Dog / All The Time / Boogie Boogie Boo (Harmonica : (Jimmie Lee MASLON)) / Rock It / The Thought Of Losing You / Wafflestompin' Man /Blue Ranger / Ballin' Keen / Let 'er Roll / Dobro Daddio From Del Rio / Tribute To Jimmie SKINNER : Born To Be Wild - How Low Can You Feel - Where My Sweet Baby Goes / Spoken Word From Jimmie SKINNER : Tribute To "You Know Who"